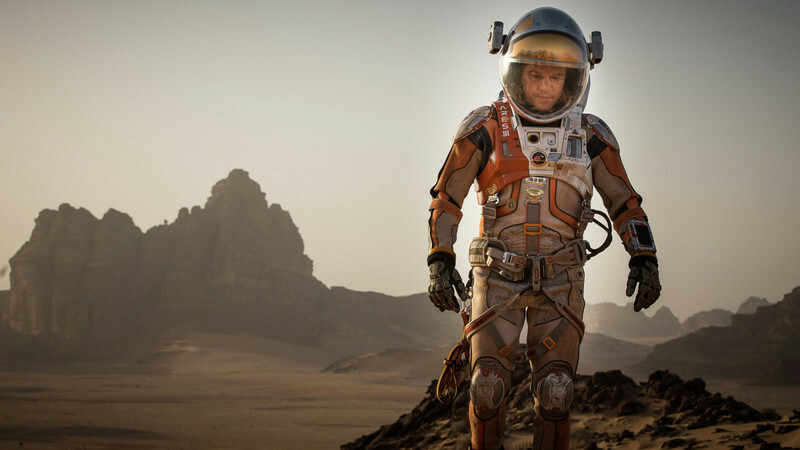 Can “The Martian” conquer the Oscars? Or will the resilient autumn hit be treated like the alien being it is—a genre flick that falls outside of what is normally considered the comfort zone of the 6,000 or so Academy voters? Consider only eight sci-fi movies have ever made the cut in the Best Picture category—and two of those, 2011’s “The Tree of Life” and 1971’s “A Clockwork Orange,” stretched the limits of what is called sci-fi way beyond its usual boundaries. As for “The Right Stuff” and “Apollo 13,” those qualify more as sci-fact while based on real events. Which is probably why, before “The Martian” opened at No. 1 on October 2, few pundits put it on their radar as having much of a chance even after director Ridley Scott’s fourth intergalactic big-screen foray collected out-of-this-world reviews at the Toronto International Film Festival the month before. The outer space adventure about an astronaut left for dead on the Red Planet impressed by being the rare popcorn flick that emphasized its botanist hero’s scientific know-how over his physical prowess, while allowing room for crowd-pleasing humor. But despite all the early plaudits for “The Martian,” none of the 22 Academy Award experts at the prognosticating website Gold Derby (including myself) listed the film among the top ten Best Picture candidates until it actually opened in theaters, and zoomed to the top of the box office chart after collecting $54 million on opening weekend. By that Monday, however, four had placed it on their lists. However, with “The Martian” coming in at No. 1 for four of the past five weeks (it dropped to second place in week three, thanks to kid-friendly newcomer “Goosebumps”), 19 out of 22 experts currently include the movie among their top picks—and four have placed it as the one to beat. In other words, “The Martian” is the very definition of the sort of film that led the Academy to alter their rules in 2009, and increase the number of Best Picture candidates on the ballot to ten. That came in response to the brouhaha over the much-admired Batman sequel “The Dark Knight” being snubbed and, for a while, the switch actually worked. The year the expansion took effect, two sci-fi offerings—the box-office behemoth “Avatar” and the more indie “District 9”—were nominated. The change also benefitted “Up,” making it only the second animated film after 1991’s “Beauty and the Beast” to make the Best Picture lineup. Same thing happened in 2010, when sci-fi thriller “Inception” and another Pixar offering, “Toy Story 3,” got in. Then the Academy decided to add some wiggle room for voters, allowing them to choose anywhere from five to ten titles—and suddenly those genres once again had a harder time squeezing in. “The Martian” isn’t alone out there among popular offerings that might get in. Yes, Pixar’s “Inside Out” is beloved and there were a whole lot of Joys seen on Halloween night. But the existence of the Best Animated Feature category already provides the genre a way to be saluted. Plus, it is in the unusual position this year of competing with the upcoming “The Good Dinosaur,” another title from the same studio. And what of the post-apocalyptic sci-fi adventure “Mad Max: Fury Road,” the long-awaited third sequel that is considered by critics as an artistic triumph for director George Miller? That it never reached No. 1 at the box office and came out in the now-distant summer has mostly taken it out of the awards conversation for now. Therefore, the question at this point is not only if “The Martian” can turn the tide and join the likes of “Star Wars” and “E.T. : The Extra-Terrestrial” as the ninth sci-fi title to compete for Best Picture, but if it can be the first one to actually win. Also, few films ever win without a Best Actor nomination. And while “The Martian” star Matt Damon shares a Best Original Screenplay Oscar with Ben Affleck for 1997’s “Good Will Hunting,” he has only two acting nominations: lead for “Good Will Hunting” and supporting for 2009’s “Invictus.” Despite strong competition this year, Damon is seen at having a solid shot at making the lead-actor cut. This is the scenario for “The Martian” for now. But several yet-to-open films—including “Joy,” “The Hateful Eight” and “The Revenant”—could potentially interfere with its trajectory as a prime competitor. Oh, there is also another sci-fi adventure you might have heard of coming out that might spoil its awards hopes: “Star Wars: The Force Awakens.” Until the seventh chapter in the legendary franchise lands in mid-December, however, “The Martian” has takeoff aplenty.